Kiryat Gat’s natural surroundings are some of the most beautiful and fascinating in Israel and are a classic example of Ben-Gurion’s vision of settling the land of Israel. Kiryat Gat was founded in the 1950’s at the heart of the lush and historical Lachish region, surrounded by thousands of acres of national parks, to serve as a regional center for the agricultural villages adjoining it. During the 1990’s, the immigration of Soviet Jewry brought many new residents to the town and its population grew to 42,500 by 1995. The development of the Rabin industrial zone on the eastern edge of the city, and the opening of Highway 6 further improved the economy of the city. The city’s current population is around 55,000 and is expected to grow to between 85-90,000 in the next 5 years. In 1999, Intel opened a chip fabrication plant, known as Fab 18, to produce Pentium 4 chips and flash memories. Intel received a grant of $525 million from the Israeli government to build the plant. In February, 2006, the cornerstone was laid for Intel’s second Kiryat Gat plant, Fab 28. Employment has improved dramatically in recent years and several companies, including Intel, HP, Visonic, Air Products, Tsabar salads, and Bonjour have offices in Kiryat Gat. Employment opportunities in Tel Aviv are also only a 30 minute train ride away. Kiryat Gat has 25 schools. Of these schools, 18 are elementary schools with a student population of 5,498, and 13 are high schools with a student population of 5,178. Kiryat Gat has a Pedagogic Center, science centers, a computerized library and a center devoted to industry, art and technology. Kiryat Gat is the exact geographical center of the country. 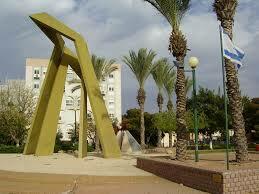 Kiryat Gat is almost equidistant to Tel Aviv, Jerusalem, and Beer Sheva – only 30-40 miles to each. It is only 12 miles away from the beaches in Ashkelon. Kiryat Gat is served by the Kiryat Gat Railway Station on the Tel Aviv – Be’er Sheva inter-city line of Israel Railways. The train runs 1-2 times an hour and there is nighttime service to the airport and Tel Aviv.Kiryat Gat is situated between two major highways, Highway 40 to the west of the town and Highway 6. Kiryat Gat’s successful history of welcoming immigrants, and helping them to integrate into the city will well serve the Anglo population that is now making Kiryat Gat their home. A local branch for the Ministry of Absorption is located in the city to assist new immigrants. Kiryat Gat has a very active community center, which provides cultural activities (music, theater, dance programs) for all ages. There is an indoor pool and an additional outdoor pool in the summer. There are a wide variety of Chugim for just about everyone. Terem recently opened a new emergency facility which serves the entire region. All the Kupot Holim, major banks and chain stores have branches in Kiryat Gat. There are several supermarkets, coffee shops ( Aroma, Cafe Cafe, and Cafe Greg ), the ubiquitous McDonald’s ( Kosher ), and some of the best felafel and schwarma in the country. Kiryat Gat is a diverse city comprised of both secular and religious Jews and there are over 100 synagogues. Both the Haredi and Dati Leumi communities are both growing. 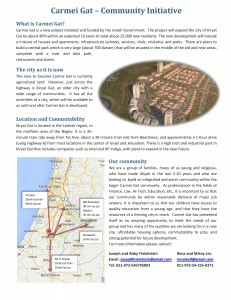 Carmei Gat, the largest building project since Modiin, is currently being built in the Northern part of the city of Kiryat Gat – just a 35-minute train ride from Tel Aviv. This new neighborhood will have 7,000 new units including apartments, duplexes and single family homes. Carmei Gat will also have its own schools, commercial areas, recreational centers and more. The government has invested in Carmei Gat as a solution to the country’s housing crisis and is putting a strong emphasis on a quick building to entry time. The first occupants are scheduled to move in Summer 2018. As of January 2018, a large group of over 25 Anglo Olim families have already bought in this project and have begun building the foundations for a warm and vibrant community.